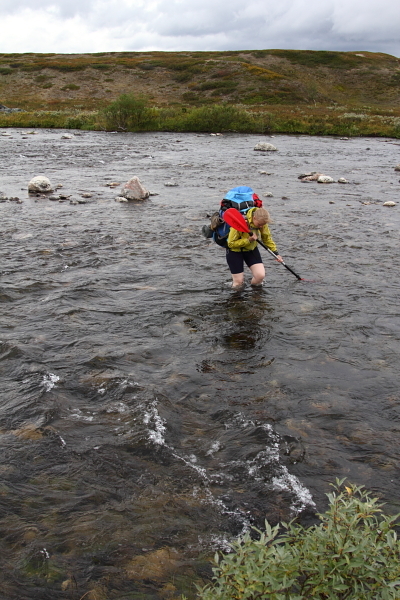 Packrafting the Reisaelva in Reisadalen. The last day of the one-week tour. 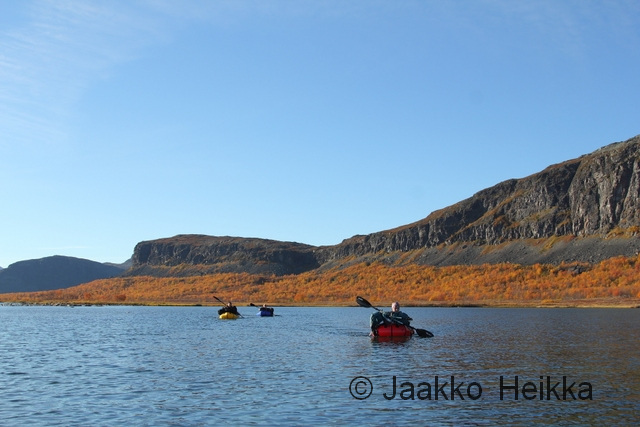 The last week I was guiding a one-week packrafting tour from Kilpisjärvi (Finland) to Reisadalen (Norway). 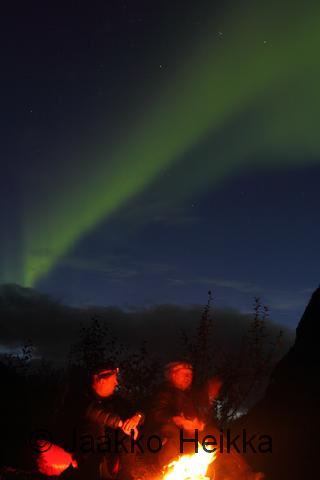 Unlike the last time I was there, we had good luck with really good weather, nice autumnal colours (ruska) and auroras almost every night. 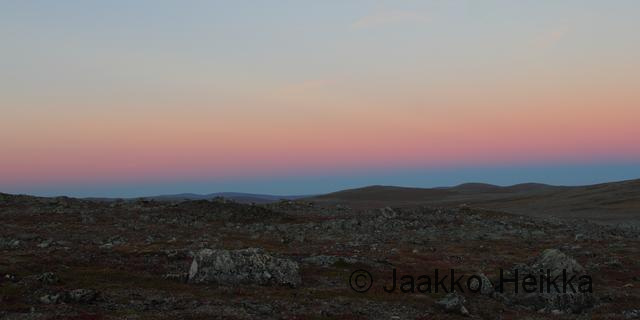 The trip started from Kilpisjärvi where we followed the Nordkalottleden near the Kuonjarjohka hut for our first night. There were some footwear problems that lead two of the clients do most of the tour in more or less improvised footwear. 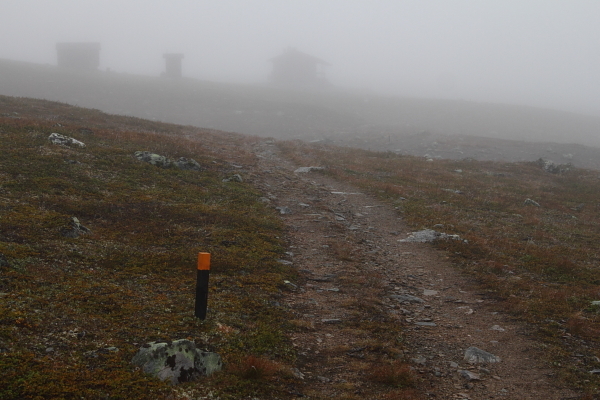 But apparently neoprene diving booties with double socks are good enough for hiking with heavy rucksack over the mountains to Norway… I had some though clients with great moral. 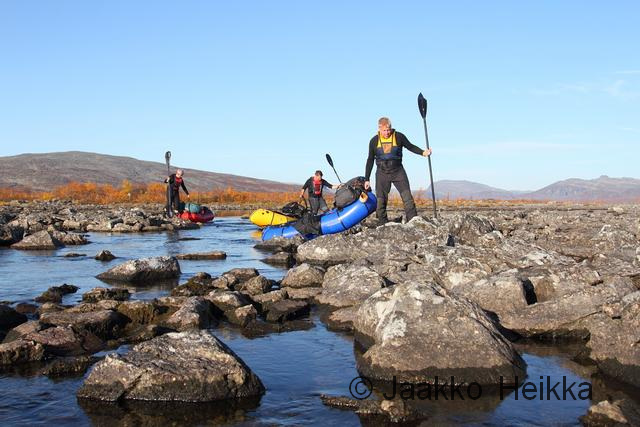 After a cold night we continued with perfect weather to Meekonjärvi where we inflated the packrafts and got on the waters. This is the most packrafts in one place in Finland that I’ve ever seen. Scenery was beautiful and water level very low. The little clouds we had the previous evening quickly made way the sunrise and a cloud inversion over the lakes. We continued with rafting going down the Poroeno river which had very, very low water level. 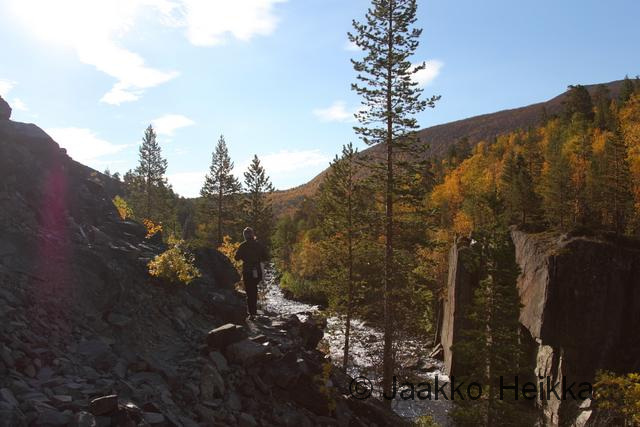 After enough of the rocky rapids we decided to switch to walking and headed towards North-East off-trail. Still perfect weather all day. The fourth day started with thick pea-soup mist that quickly changed to blue skies and just as quickly turned into cold drizzle with wind and thick cloud cover. 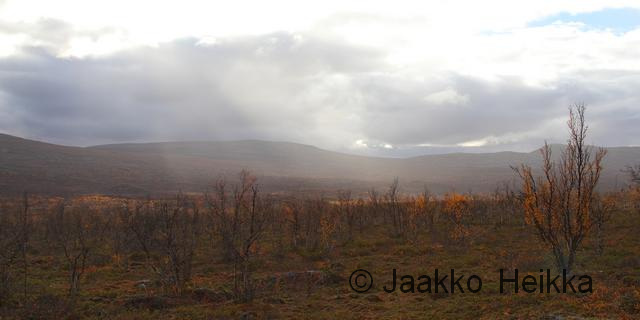 Luckily the clouds broke and the sun returned in the afternoon once little further on the Norwegian side of the border. Even though I say it myself, the navigation on this off-trail sections went very smoothly. 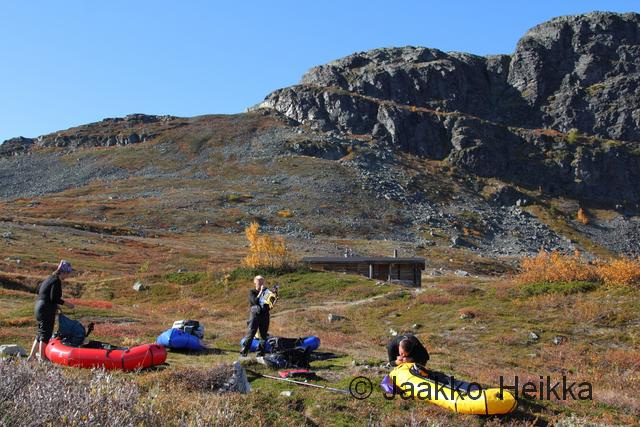 We decided to push little longer than planned and ended up camping in the tree line on the slopes of Jierta fjell. 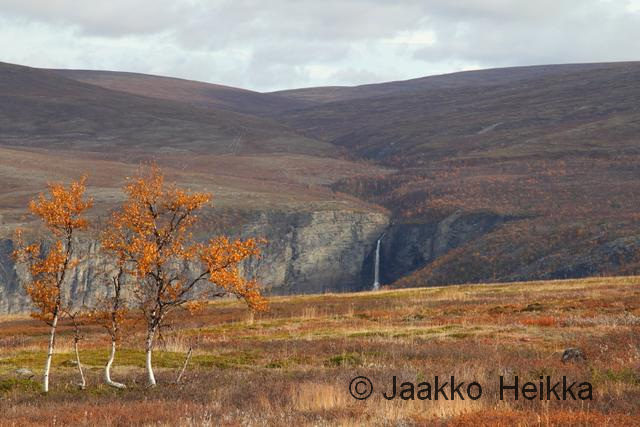 The fifth day was short: traverse the slopes of Jierta, descent down into the Reisadalen canyon/valley/ravine and follow a trail to Nedrefosshytta hut. A luxurious hut on Finnish standards with sauna and everything. Long afternoon and evening to relax after the initial longer days: good food, a bit of reading, sauna and swim in the river with auroras later in the night. 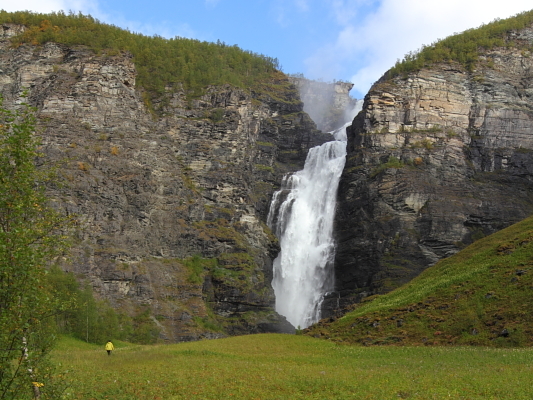 The next day we did a day-hike up the Reisaelva river to Imofossen waterfall. The trail up to the waterfall was interesting but easy enough without backpacks. The river looks great further up from the hut except for the narrow canyon closer to the (definitely not boatable) waterfall. I think the canyon might be packraftable… I would just need skilled company, some climbing gear to descent in and then a big commitment to run it down… After the day trip we tidied the cabin, lashed rucksacks on the packrafts and headed down stream in search of a perfect gravel bar camp site. And we found one. 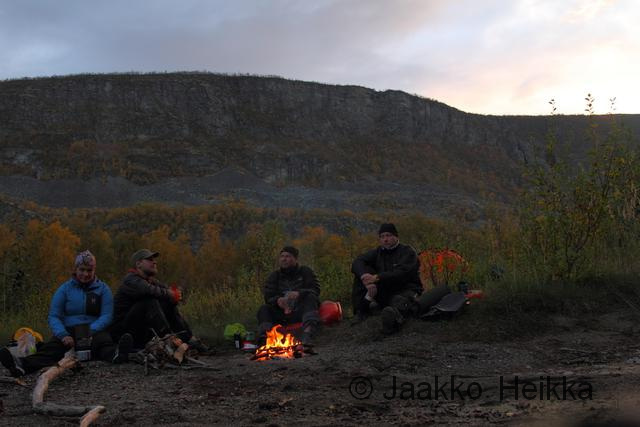 Later in the evening it turned into even more of a perfect spot with good company, camp fire and auroras dancing above the canyon walls. It was simply a splendid tour. On tours like this it’s easy to love my job. This was the last guided packraft tour I’ll be doing this year but if you’re interested, I will be offering more the next year! And if you would like to see more photos, there are plenty more in my gallery. Packrafts for the tour were from Backpacking North. 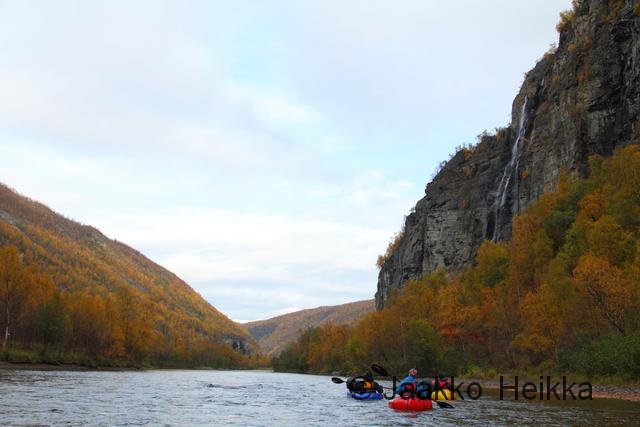 If you need a packraft, support a local business and rent one from here. 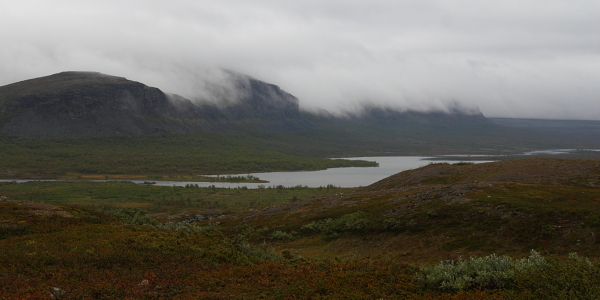 The second of the three #HikingNorth trips is done and me and N are heading towards Sarek National Park for the third trip before returning back to South. 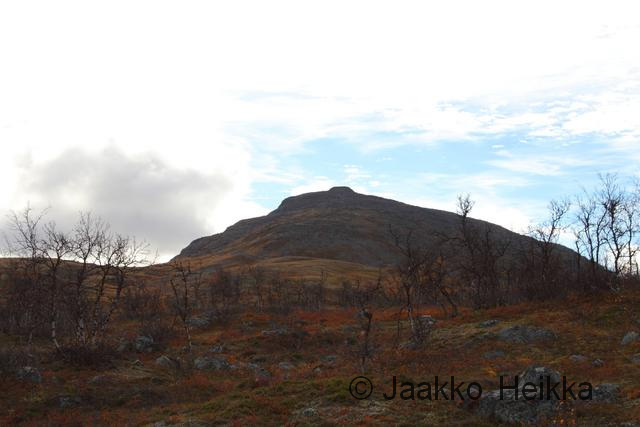 While we are hiking in the Sarek, here are some pictures from the second trip from Kilpisjärvi (Finland) to Reisadalen (Norway). 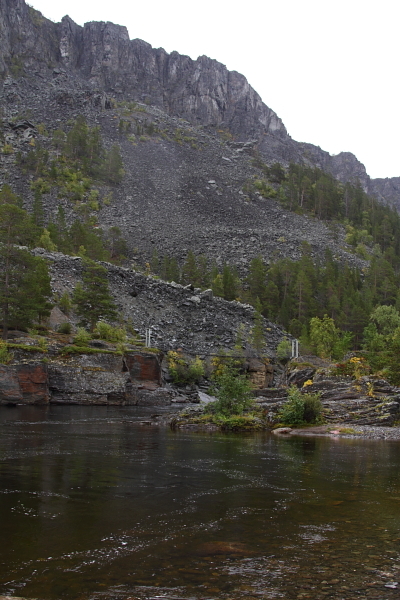 It didn’t go quite according to the plan but turned out to be a nice packrafting trip after all, thanks to the great float down the Reisaelva river. 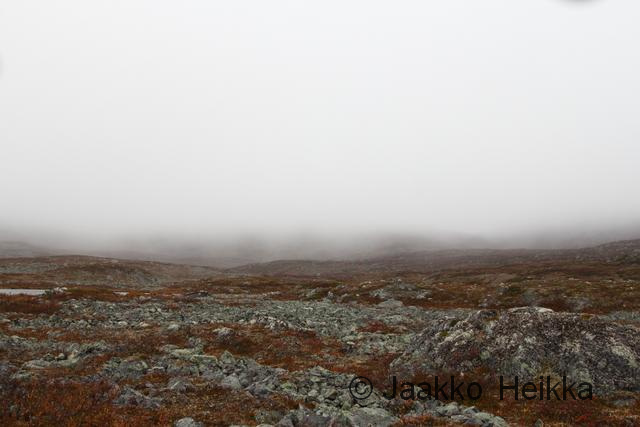 The trip started from Kilpisjärvi on Monday morning – in very uninspiring rain. 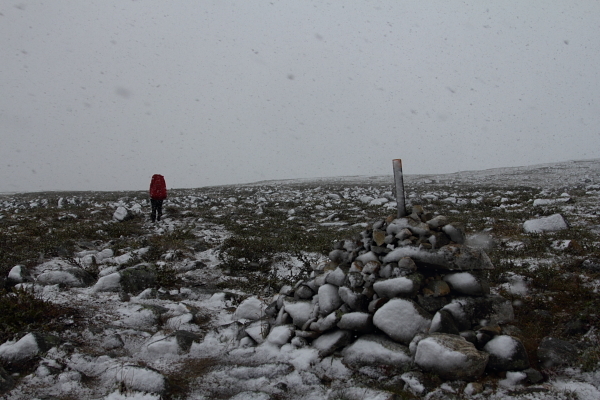 As we gained altitude the rain turned into wind-driven sleet and soon into snow. 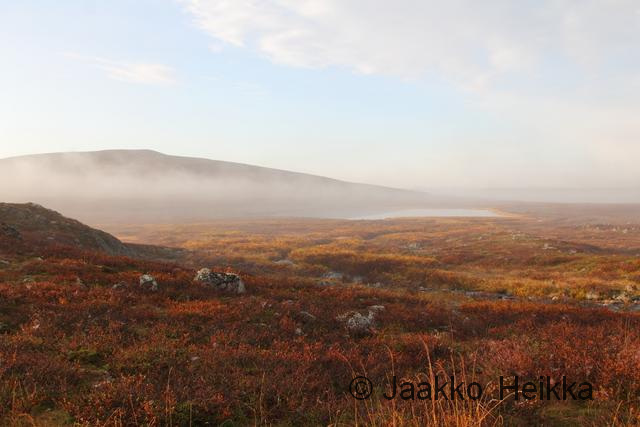 The temperature was around zero and it started to look more like an early winter trip than autumn trip. 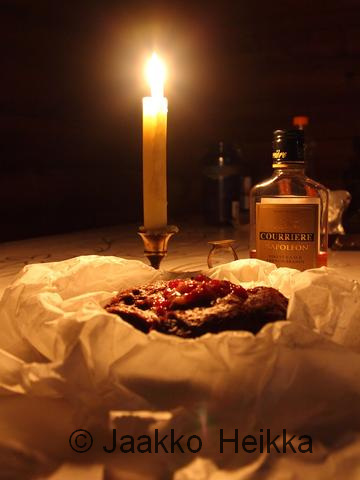 As the shell clothing slowly failed and the weather stayed miserable we decided to cut the day short and spend the first night in open wilderness hut at Saarijärvi. The second day the weather improved a little bit being mostly foggy with a bit of drizzle. 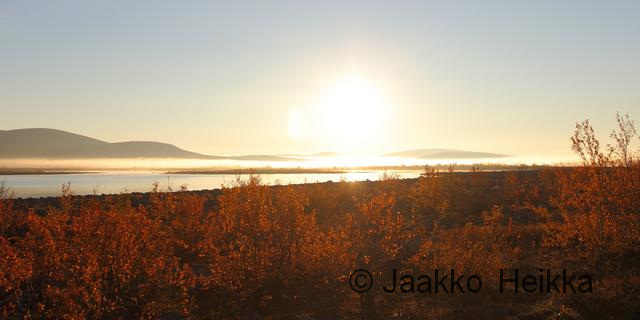 The views at Kuonjarjoki seemed quite similar to what Mark and Roger had about two months earlier. 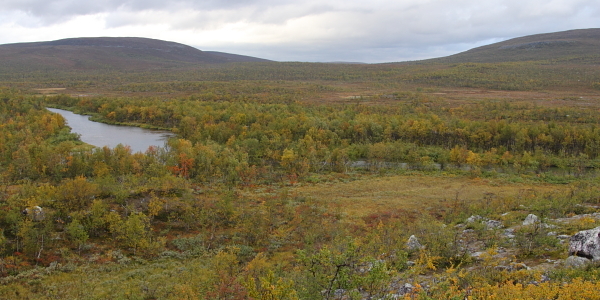 After a lunch break at Kuonjarjoki we continued to Meekojärvi. 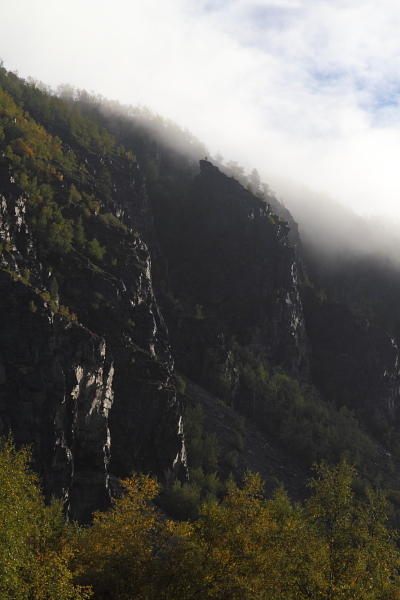 As we descended down to the valley the clouds broke for a while. 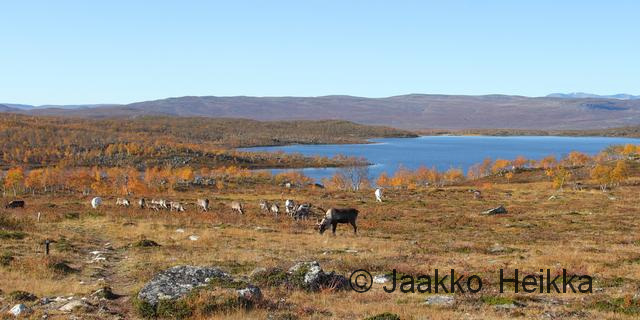 We slept in tent near the open hut at Meekojärvi with large reindeer guarding the surroundings. 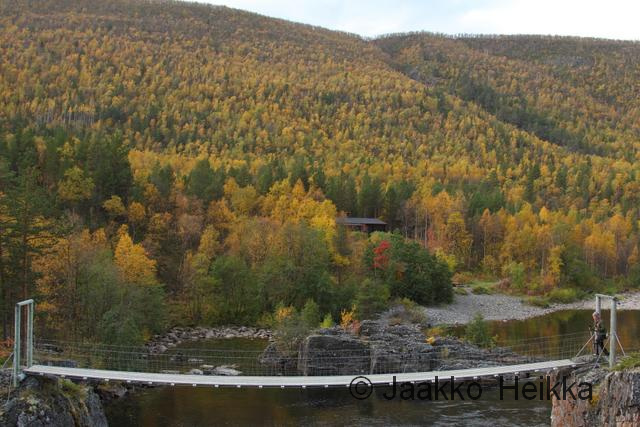 We crossed the Valtijoki river which had considerably lower water level than in mid-July the last year. 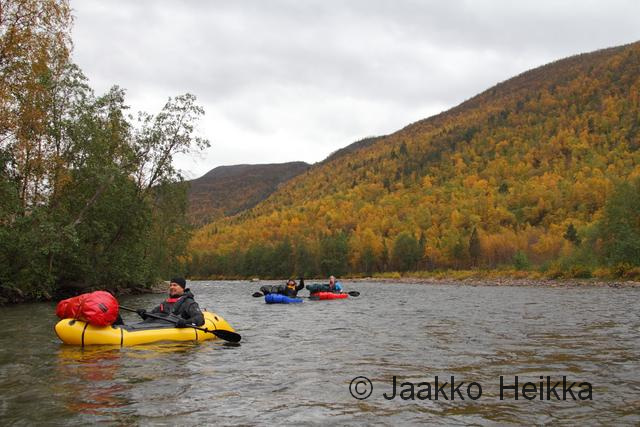 The water level was probably too low even for packrafting. 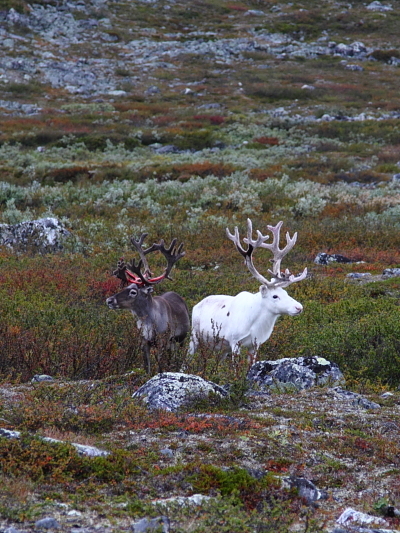 On the first two days on Kalottireitti trail we met something like over 40 people but during the third and fourth day going off-trail we did’t see any humans, only reindeers and birds. 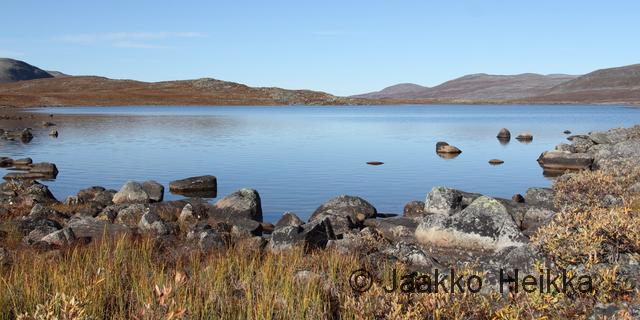 After a hard day of walking (the rucksack felt quite heavy with all the packrafting gear) we camped near the Norwegian border at Inggajärvi lake. 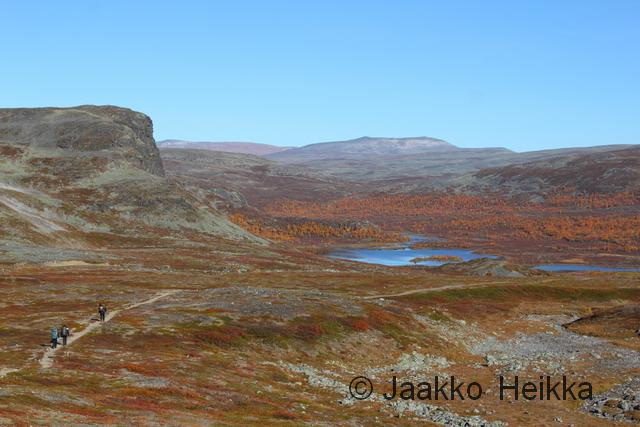 The next day we crossed the border walking towards Reisadalen with the Jierta fjell as a landmark in the horizon. 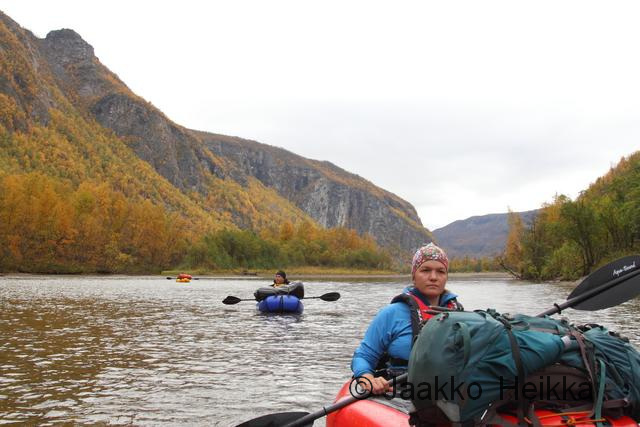 On the way we crossed Gieddajohka river with one packraft (taking first packs to the other side and then N). After the disappointments when trying to paddle the lakes it made me feel that there was maybe some point in carrying the packrafts after all. At least we didn’t have to swim. 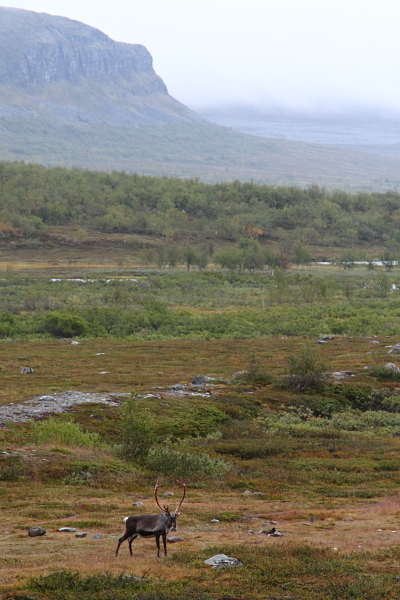 We camped on the shore of a little lake with reindeers accompanying us. The fifth day started with rain and overcast but it didn’t slow us down. The slope down to Reisadalen valley was occasionally a bit hard, maybe a 30 degree slope with wet crass and as the soles of my trail runners were pretty worn out I took occasional slides down the slope but luckily there were trees to stop the glisades. 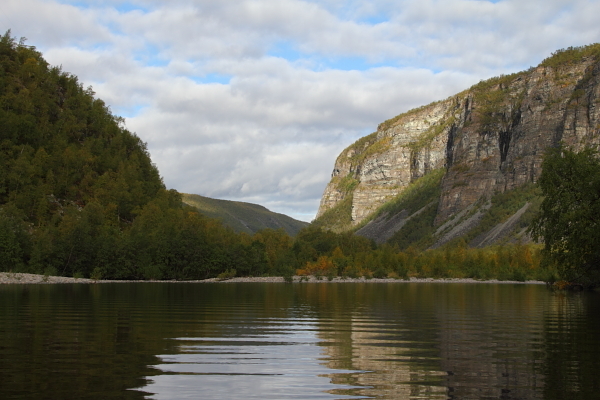 After the descent we arrived to Neddrefosshytta, admired the surroundings, had lunch and inflated the rafts and started the float down. 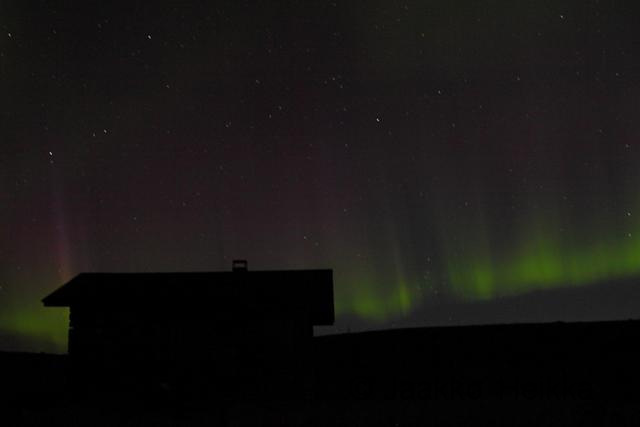 We floated only about an hour as I wanted to find a good camping spot well before the dark. And we found a very nice spot on a gravel bar with enough drift wood for a small fire and good views to the surrounding canyon. 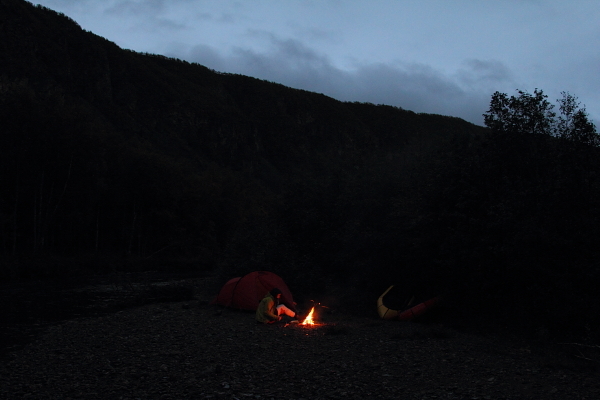 Rain showers and some late-season bugs (no bugs up on the fjells but quite some in the valley) interrupted occasionally the evening by the fire but it wasn’t too bad. The final morning of the trip broke with spectacular views and we finally got some real sun shine! Morning chores were soon followed by a good swift float down stream the easy but fast river. 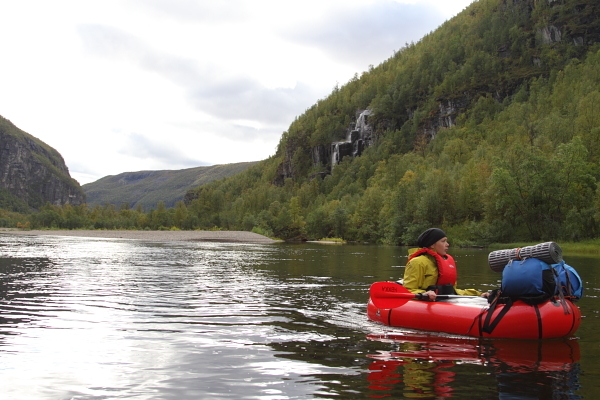 The Reisaelva has a good flow and there are no real rapids on the way from Neddrefosshytta to Saraelv and thus it makes great packrafting also for beginners. 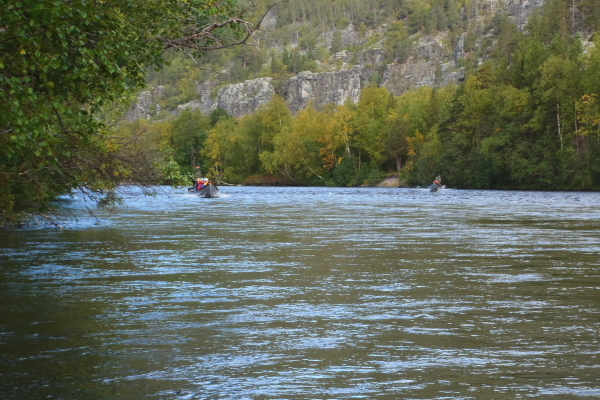 A little downside on the Reisaelva is the quite frequent boat traffic up and down the river. This didn’t bother as too badly but it removes the feeling of real wilderness quite effectively. 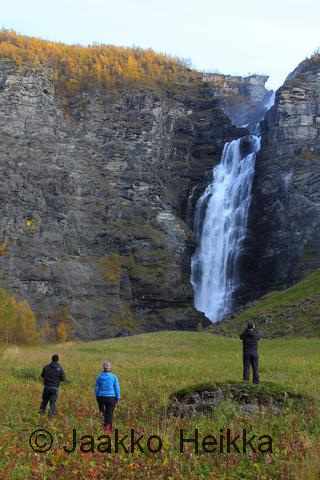 The canyon/valley is a great sight in itself but one the major sights on the way is the Mollisfossen waterfall. Unfortunately it’s on the other side of the river than the Kalottireitti trail but for a boater that isn’t a problem at all. 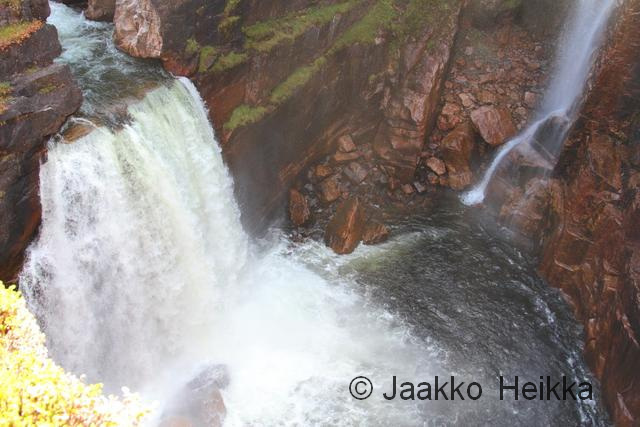 And the 269 meter high waterfall is worth a visit but crossing the river without a boat would require swimming is swift current. 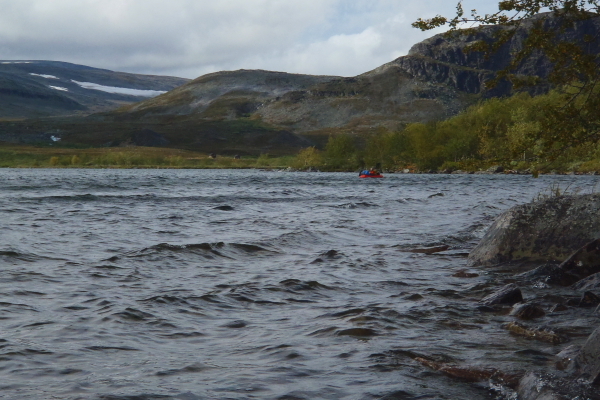 The 25km float from Neddrefosshytta to Saraelv (the end of public road with a good parking space) took only about 6 hours of lazy packrafting so it is good float! 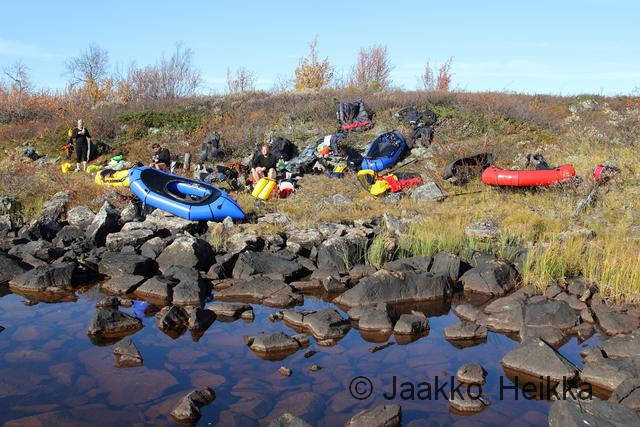 Even though we had to skip about half of the originally planned packrafting the Reisaelva saved a lot and left me wanting more. 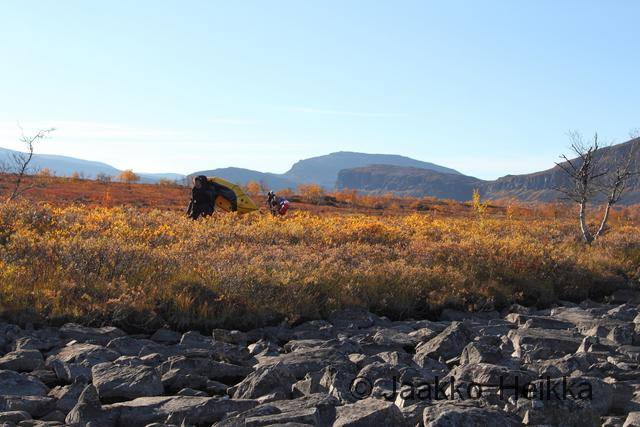 I think that on this trip I also understood better the role of packrafts as wilderness travel tools in addition to tools for accessing remote rapids and having easy white water fun. 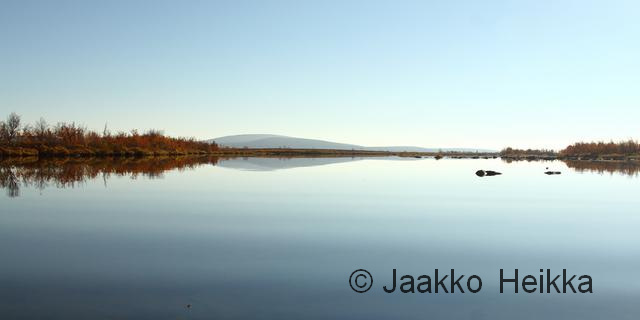 The packrafts are equally suitable for both, though for wilderness travel one should reserve enough time for things like serious headwinds on flat water. Our schedule didn’t allow any slack and it would be better to reserve around eight days for the originally planned route (instead of the six days we had). Once again The Social Hiking map (based on Yellowbrick beacons) gives you a good idea about the trip but once again the distance covered (149km) feels quite a bit exaggerated. The Yellowbrick YBlog page gives you some additional info like some speed figures. 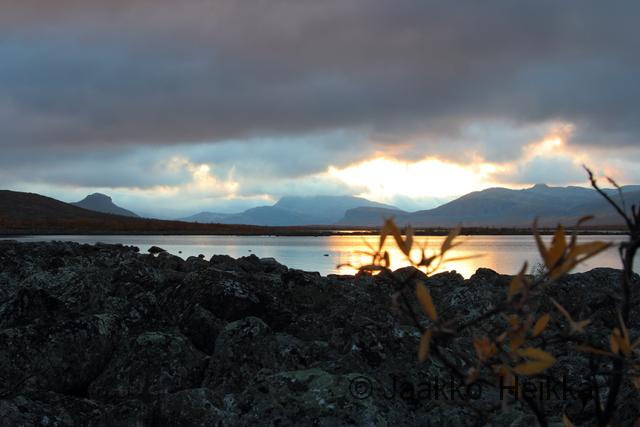 Pictures linked to the map are coming later when I get the last week+ trip in Sarek done… And you can also follow the trip on Social Hiking as well as on Twitter!